حسینی, سید قربان, ایومن, اسماعیل. (1394). بررسی فعالیت کاتالیست نانوذره های CuO در تجزیه گرمایی آمونیوم پرکلرات. نشریه شیمی و مهندسی شیمی ایران, 34(2), 13-23. سید قربان حسینی; اسماعیل ایومن. "بررسی فعالیت کاتالیست نانوذره های CuO در تجزیه گرمایی آمونیوم پرکلرات". نشریه شیمی و مهندسی شیمی ایران, 34, 2, 1394, 13-23. حسینی, سید قربان, ایومن, اسماعیل. (1394). 'بررسی فعالیت کاتالیست نانوذره های CuO در تجزیه گرمایی آمونیوم پرکلرات', نشریه شیمی و مهندسی شیمی ایران, 34(2), pp. 13-23. حسینی, سید قربان, ایومن, اسماعیل. بررسی فعالیت کاتالیست نانوذره های CuO در تجزیه گرمایی آمونیوم پرکلرات. 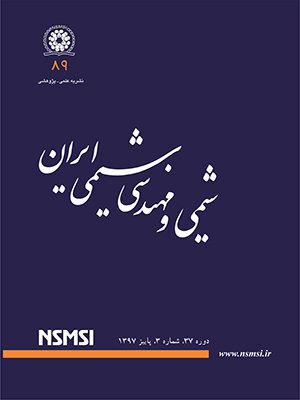 نشریه شیمی و مهندسی شیمی ایران, 1394; 34(2): 13-23. در این پژوهش، تجزیه گرمایی آمونیوم پرکلرات با افزودن نانوذره‌هایCuO تجاری بررسی شده است. نانوذره‌های CuO با روش‌های مشخصه‌یابی پراش اشعه ایکس (XRD) و میکروسکوپ الکترونی عبوری (TEM) بررسی شد. تصویر آنالیز TEM نشان می‌دهد که نانوذره‌های CuO دارای مورفولوژی به تقریب کروی هستند. فعالیت کاتالیستی نانوذره‌های CuO بر تجزیه گرمایی آمونیوم پرکلرات (AP) با آنالیزهای گرمایی DSC و TGA بررسی شد، که نتیجه‌ها نشان می‌دهند دماهای تجزیه گرمایی AP در حضور 2 و 5 درصد وزنی از نانوذره‌های CuO به‌ترتیب 11/61 و ˚C 59/72 کاهش می‌یابد. همچنین، نتیجه‌ها دلالت بر این دارند که گرمای تجزیه AP در حضور 2 و 5 درصد وزنی از نانوذره‌های CuO به‌ترتیب 51/528 و J/g 11/535 افزایش می‌یابد. نتیجه‌های آنالیز TGA برای ارزیابی پارامترهای سینتیکی نمونه‌ها با استفاده از روش برازش مدل برای محاسبه مقدارهای A، Ea، G≠∆، H≠∆ و S≠∆ استفاده شده است. Chunwei W., Kyl S., Snehaunshu C., Guoqiang J., Lei Z., Michael R.Z., Encapsulation of Perchlorate Salts within Metal Oxides for Application as Nanoenergetic Oxidizers, Advanced Functional Materials, 22 (1): 78-85 (2012). John A., Christopher J., “Chemistry of Pyrotechnics Basic Principles and Theory”, CRC Press, Second Edition (2011). Singh N.B., Ojha A.K., Co-precipitation of a Mixture of CuO and Cr2O3 Through NaNO3-KNO3 Eutectic Mixture and its Catalytic Activity, Indian Journal of Chemistry, 42 (10): 2475-2479 (2003). Carnes L.C., Klabunde K.J., The Catalytic Methanol Synthesis over Nanoparticle Metal Oxide Catalysts, Journal of Molecular Catalysis A: Chemical, 194 (1-2): 227-236 (2003). Fujimura K., Miyake A., The Effect of Specific Surface Area of TiO2 on the Thermal Decomposition of Ammonium Perchlorate, Journal of Thermal Analysis & Calorimetry, 99 (1): 27–31 (2010). Chen L.J., Li G.S., Qi P., Li L.P., Thermal Decomposition of Ammonium Perchlorate Activated via Addition of NiO Nanocrystals, Journal of Thermal Analysis and Calorimetry, 92 (3): 765-769 (2008). Zhang W.J., Li P., Xu H.B., Sun R., Qing P., Zhang Y., Thermal Decomposition of Ammonium Perchlorate in the Presence of Al(OH)3·Cr(OH)3 Nanoparticles, Journal of Hazardous Materials, 268: 273-280 (2014). Zheng X., Li P., Zheng S., Zheng Y., Thermal Decomposition of Ammonium Perchlorate in the Presence of Cu(OH)2·2Cr(OH)3 Nanoparticles, Powder Technology, 268: 446-451 (2014). Hosseini S.G., Abazari R., Gavi A., Pure CuCr2O4 Nanoparticles: Synthesis, Characterization and their Morphological and Size Effects on the Catalytic Thermal Decomposition of Ammonium Perchlorate, Solid State Sciences, 37: 72-79 (2014). Yadav T.P., Yadav R.M., Singh D., Mechanical Milling: a Top down Approach for the Synthesis of Nanomaterials and Nanocomposites, Nanoscience and Nanotechnology, 2 (3): 22-48 (2012). Sharma J.K., Srivastava P., Singh G., Akhtar M.S., Ameen S., Green Synthesis of Co3O4 Nanoparticles and their Applications in Thermal Decomposition of Ammonium Perchlorate and Dye-Sensitized Solar Cells, Materials Science and Engineering B, 193: 181–188 (2015). Sharma J.K., Srivastava P., Singh G., Akhtar M.S., Ameen S., Biosynthesized NiO Nanoparticles: Potential Catalyst for Ammonium Perchlorate and Composite Solid Propellants, Ceramics International, 41 (1): 1573–1578 (2015). Singh G., Kapoor I. P. S., Dubey S., Siril P.F., Preparation, Characterization and Catalytic Activity of Transition Metal Oxide Nanocrystals, Journal of Scientific Conference Proceedings, United States of America, 1: 11-17 (2009). بزرگ نیا، مریم؛ توفیقی داریان، جعفر، ارایه‌ی یک مدل سینتیکی و مدل‌سازی واکنش‌های تصفیه هیدروژنی گازوییل برج تقطیر خلا، شیمی و مهندسی شیمی ایران، (3)32: 31-38 (1392). Yang Y., Xinjie Y., Wang J., Wang Y., Effect of the Dispersibility of Nano-CuO Catalyst on Heat Releasing of AP/HTPB Propellant, Journal of Nanomaterials, 2011: 1-5 (2011). Janasi S.R., Rodrigues D., Landgraf F.J.G., Effect of Calcination Conditions on the Magnetic Properties of MnZn Ferrites Powders Produced by Co Precipitation, Materials Science Forum, 498: 119-124 (2005). Lei S.J., Tang K.B., Zheng H.G., Preparation of α-Mn2O3 and MnO from Thermal Decomposition of MnCO3 and Control of Morphology, Materials Letters, 60 (1): 1625-1628 (2006). Hong Z.S., Cao Y., Deng J.F., A Convenient Alcohothermal Approach for low Temperature Synthesis of CuO Nanoparticles, Materials Letters, 52 (1-2), 34-38 (2002). Wang J., Shanshan H., Zhanshuang L., Xiaoyan J., Milin Z., Zhaohua J., Synthesis of Chrysalis Like CuO Nanocrystals and Their Catalytic Activity in the Thermal Decomposition of Ammonium Perchlorate, Journal of Chemical Sciences, 121 (6): 1077-1081 (2009). Kung H.H., “Transition Metal Oxides: Surface Chemistry and Catalysis”, Elsevier, (1989). Hinklin J., Azurdia T.R., Kim M., Marchal J.C., Kumar S., Laine R.M., Finding Spinel in All the Wrong Places, Advanced Materials, 20 (7): 1373–1375 (2008). Boldyrev V.V., Review Thermal Decomposition of Ammonium Perchlorate, Thermochimica Acta, 443 (1): 1–36 (2006). Seiyama T., Egashira M., Iwamoto M., “Some Theoretical Problem of Catalysis”, University of Tokyo Press, Tokyo (1973). ایومن، اسماعیل؛ احمدوند، هادی؛ قوی، اعظم؛ حسینی، سید قربان، مروری بر کاربرد نانو کاتالیست‌های اکسید فلزی بر تجزیه حرارتی آمونیوم پرکلرات، نشریه تحقیق و توسعه مواد پرانرژی، (3)20: 3 تا 14 (1392). Joshi S.S., Prajakta R.P., Krishnamurthy N.V., Thermal Decomposition of Ammonium Perchlorate in the Presence of Nano-sized Ferric Oxide, Defense Science Journal, 58 (6): 721-727 (2008). Peng Z., Li S.D., Huang M.F., Xu K., Thermogravimetric Analysis of Methyl Methacrylate-Graft-Natural Rubber, Applied Polymer Science, 85 (14): 2952-2955 (2002). Vyazovkin S., Wight C.A., Isothermal and Nonisothermal Reaction Kinetics in Solids:In Search of Ways toward Consensus, Physical Chemistry A, 101 (44): 8279-8284 (1997). Peng Z., Kong L.X., A Thermal Degradation Mechanism of Polyvinyl Alcohol/Silica Nanocomposites, Polymer Degradation and Stability, 92 (6): 1061-1071 (2007). Carr R.W., "Comprehensive Chemical Kinetics, Modeling of Chemical Reactions", Elsevier, (2007). Wang D., Kang Y., Lu L., Preparation and Thermal Decomposition Kinetics of Copper(II) Complex with 1-(6-Hydroxynaphthalen-2-yl)butane-1,3-dione, Iran. J. Chem. Chem. Eng. (IJCCE), 32 (1): 49-56 (2013). Dubey R., Srivastava P., Kapoor I.P.S., Singh G., Synthesis, Characterization and Catalytic Behavior of Cu Nanoparticles on the Thermal Decomposition of AP, HMX, NTO and Composite Solid Propellants, Part 83, Thermochimica Acta, 549: 102– 109 (2012). Sestak J., Berggren G., Study of the Kinetics of the Mechanism of Solid State Reactions at Increasing Temperatures, Thermochimica Acta, 3 (1): 1-12 (1971). Hosseini S.G., Eslami A., Thermoanalytical Investigation of Relative Reactivity of Some Nitrate Oxidants in Tin-Fueled Pyrotechnic Systems, Journal of Thermal Analysis and Calorimetry, 101 (3): 1111–1119 (2010). Eslami A., Hosseini S.G., Bazrgary M., Improvement of Thermal Decomposition Properties of Ammonium Perchlorate Particles Using Some Polymer Coating Agents, Journal of Thermal Analysis and Calorimetry, 113 (2):721-730 (2012). Chang R., “Physical Chemistry for the Biosciences”, Sansalito, CA: University Sciences Books (2005). Low P.S., Bada J.L., Somero G.N., Temperature Adaptation of Enzymes: Roles of the Free Energy, the Enthalpy, and the Entropy of Activation, Proceedings of the National Academy of Sciences of the United States of America,70 (2): 430-432 (1973).